The Northgate Peaks Trail is a fairly short and easy family hike to an interesting viewpoint in the Kolob Terrace section of Zion. This lesser-traveled trail was created in the 1980s, making it a fairly recent addition to the park's canon of official trails and it offers a good escape from the crowds of the main canyon. 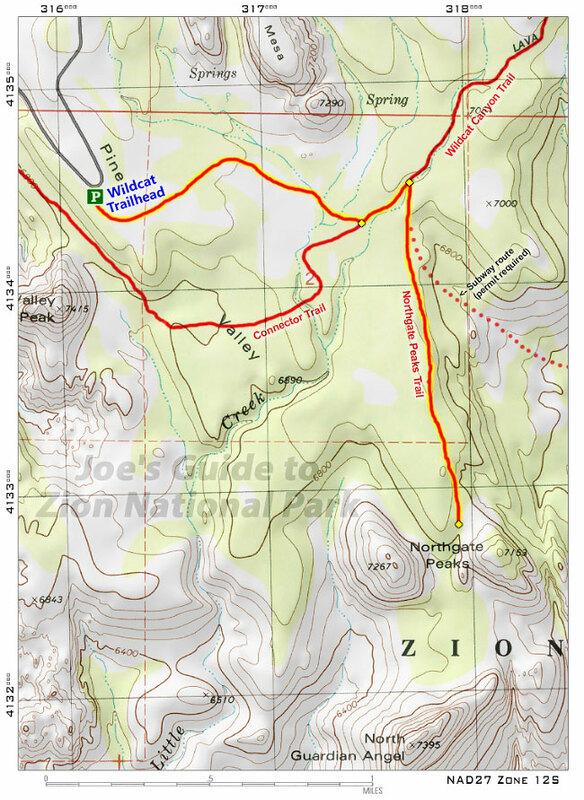 To get to the trailhead, drive north up the Kolob Terrace Road (off of Route 9 in the town of Virgin, west of Springdale) roughly 15.5 miles to the Wildcat Canyon Trailhead. If you have never driven through the Terrace section before, you will find the scenery a fascinating change of pace from the scenery in the main canyon. Seasons: Spring through fall. Access road to trailhead is not plowed in winter. The Wildcat Canyon Trailhead is an easy to spot parking area located 15.5 miles up the Kolob Terrace Road, roughly .8 miles beyond a sharp U-turn in the road that heads up a steep hill to the upper plateau. The trailhead has an official NPS marker and display case with information on hikes in the area, including the popular Subway "Top-Down" route which also starts at this trailhead. A hike on the Northgate Peaks Trail is roughly 4 miles (round-trip) on mostly level terrain and could take 2-4 hours, depending on how leisurely you go. 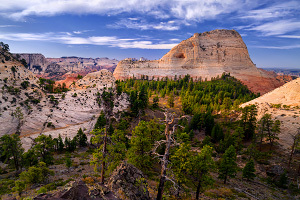 Hike along the well-defined trail (an old 4x4 road) as it meanders through mostly level terrain of a beautiful pinion forest with open fields and a few bleach-white sandstone formations in the distance. 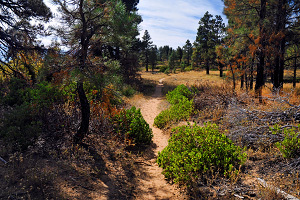 After roughly a mile, the trail intersects with the Connector Trail/Wildcat Canyon Trail; turn east (left) towards Lava Point. Then after only another .2 miles, turn right (south) onto the Northgate Peaks Trail proper. After only another .2 miles, you will see a signpost that marks the Subway Top-Down Route down into Russell Gulch, but stay on the main trail as it heads south through the forested meadows. After another mile, you will reach the end of the trail, a nice viewing area located on top of a pile of volcanic boulders--a perfect spot to relax and have lunch. The view at the end of the trail is a bit subtle compared to the views from the West Rim Trail or the main canyon, but it gives you a fascinating peek into the Great West Canyon -- from the two Northgate Peaks to your left and right to the North Guardian Angel directly to the south, the East and West Northgate Peaks on both sides, and the Left Fork of North Creek ("The Subway") hidden behind. When you have had enough, return the way you came. This isn't the most exciting trail in the park, but is one of the few easy hikes in the Kolob Terrace, so it's a great excuse to leave the main canyon and see some different scenery. The trail is fairly level with no exposed sections, so it would be a good choice for those hiking with children.